In May the Taiping Heritage society has organised a trip to the Lenggong valley, see my blog THS excursion . Last week THS organised a members night and they had asked me to give a talk about the trip. Preparing for my talk, I collected a lot of information from the Internet, but I had not enough time to present everything in my talk…:-) That is the reason for this post. Some comments about the various locations. 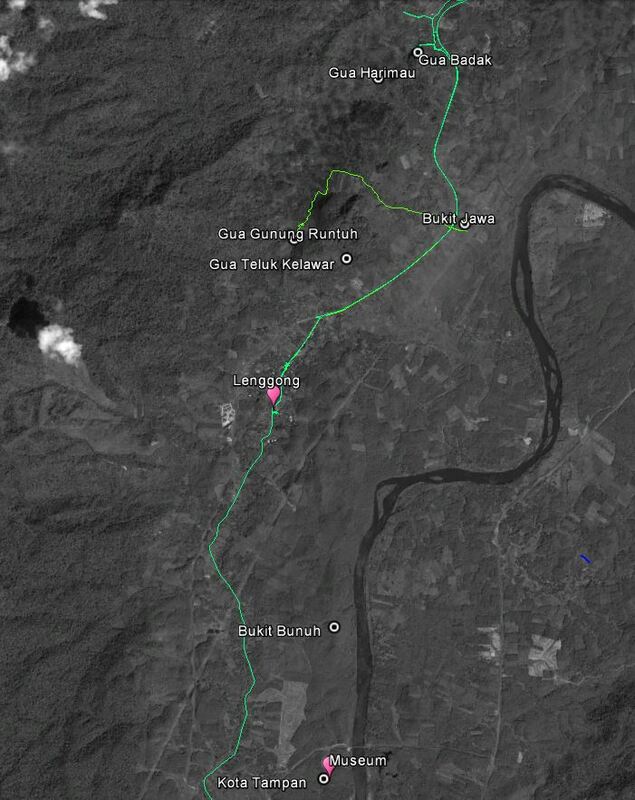 The skeleton of the Perak Man has been found in the Gua Gunung Runtuh. It is now exhibited in the Lenggong Museum. The Gunung Runtuh cave is at the moment closed to the public, but in 2007 we could still enter the cave after a steep climb..:-) The skeleton was originally surrounded by grave gifts, in the museum now it is surrounded by high-tech gadgets to control humidity, etc! The other archaeological sites in the Lenggong valley have until now only shown evidence of human activity in the form of tools and “tool shops”, where these tools were manufactured. The oldest of these sites is Bukit Jawa, a palaeolithic tool workshop site on the shores of an island in a lake now long ago disappeared. About 200.000-300.000 years ago. Who made those tools? 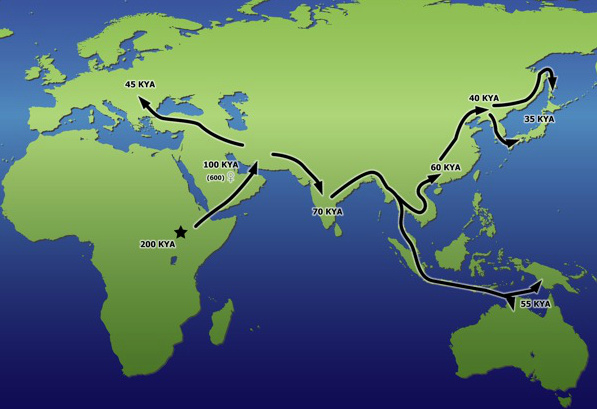 This is before our species, Homo Sapiens sapiens, started the emigration out of Africa. We will only know when fossil remains of hominins are found. We visited Bukit Jawa in 2007, there is not much to see. The toolshops at Kota Tampan are younger, about 70.000 year old. Also here no fossils of human remains have been found, but it is quite possible that the people making these tools, belonged to our species (see below). Activity in these workshops came to an abrupt end when the Toba volcano erupted, Kota Tampan tools have been found covered wit the thick layers of ash. At the Kota Tampan location the Lenggong Museum has been built. Next in age are the toolshops at Bukit Bunuh, about 40.000 years old. 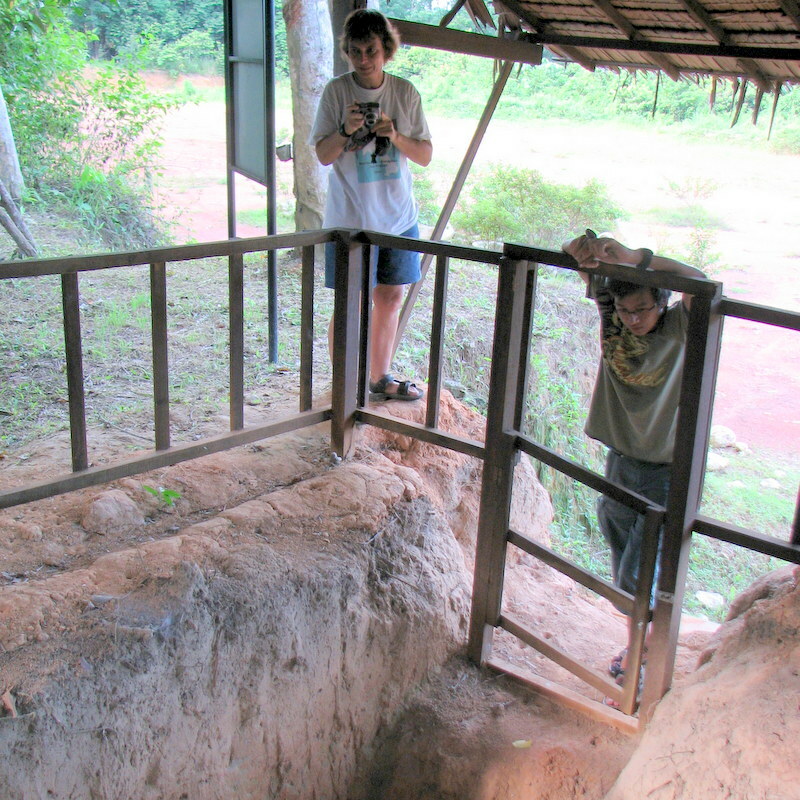 Followed by the two caves where the Perak Man and Woman were found. Altogether an impressive collection of archaeological sites, hopefully they will be preserved well after being declared a World Heritage Site. Human migration, Out of Sundaland ? It is about 200.000 years ago that our species, homo sapiens sapiens evolved in Africa. All humans, living these days, have a common ancestor, both in the maternal line (Mitochondrial Eve) and the paternal one (Y-chromosomal Adam). 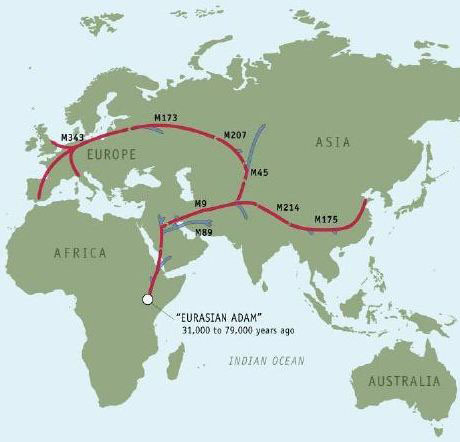 Between 95.000 and 75.000 year ago one of their descendants (Eurasian Adam), started to migrate to Europa and Asia. By analysing the mutations in the DNA of the Y-chromosome of present humans, it is possible to get an idea about the migration route followed by the ancestors. A few years ago both Aric and I had our DNA analysed (by the Genographic Project). Here is the route followed by our (paternal) ancestor. Our routes split about 35.000 year ago, in what is now called Tajikistan. My line developing into a Caucasian, Aric’s line into a Chinese…:-) See my blog My ancestors for more information about this fascinating topic. In the map above, the location of the Toba eruption is indicated. This dismal eruption and the following volcanic winter may have had a dramatic effect on the still very small global homo sapiens population, killing most of them and causing what is called a genetic bottleneck It is estimated that the global population of our species at that time was no more than 10.000 – 20.000! It certainly stopped the operation of the Kota Tampan tool shops. But the people living there may have survived in small numbers, because the prevailing winds were westwards. 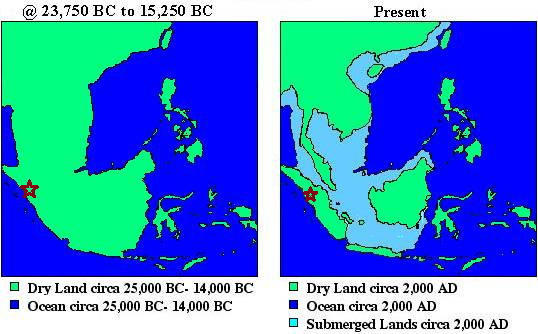 Could it be that after the Toba eruption, further migration took place out of Sundaland? A fascinating, though rather controversial theory, proposed by the British geneticist Stephen Oppenheimer. No surprise that USM, responsible for much of the archealogical research in the Lenggong valley, is quite happy with this theory. Malaysia as the cradle of humanity! 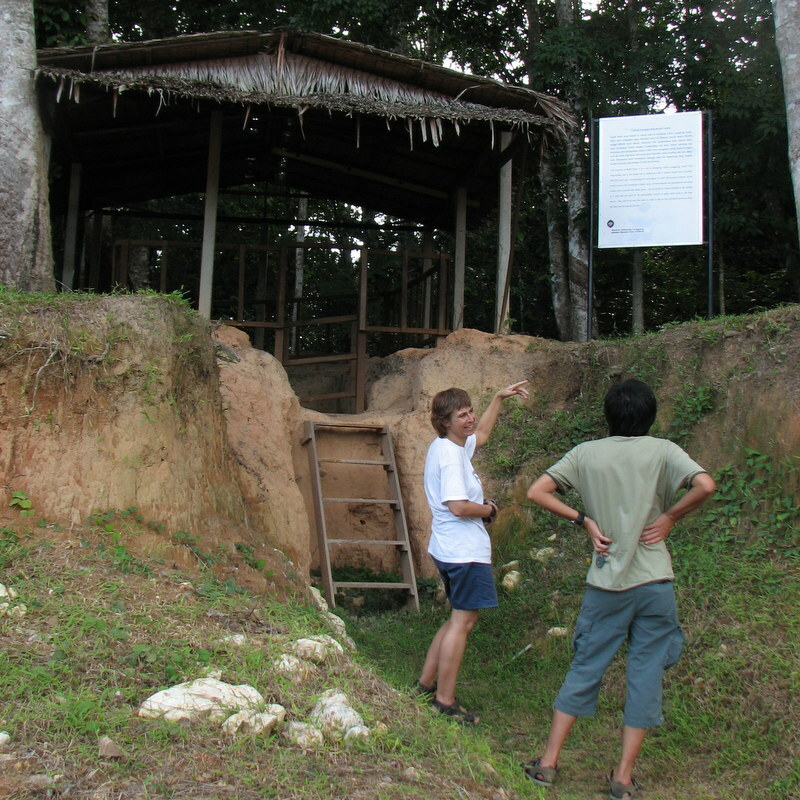 In 2009 USM announced a spectacular discovery at Bukit Bunuh. At this location many boulders were found of a very special material, called suevite. Suevite can be formed when a meteorite collides with the earth. The ages of these rocks, using fission track dating, has been determined as 1.8 ± 0.6 million year. There are indications of circular craters in the Bukit Bunuh region, so it could well be that between 1.2 and 2.4 million year ago a meteorite has hit here. In itself already an interesting discovery. It became spectacular when in 2007 a hand-axe was found, embedded in a suevite boulder. Meaning that around the time of impact, 1.8 million year ago, hominins were already living at Bukit Bunuh! 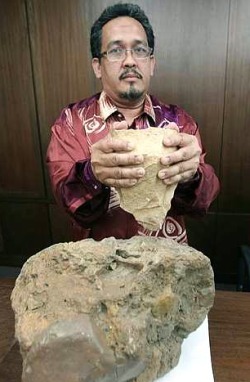 Here is a newspaper article about the discovery: Early axes found in Perak. The picture shows Dr Mokhtar Saidin, holding up the axe. Last week it was full moon, and not just an ordinary one, but a perigee full moon, often popularly called a “Super Moon”. The orbit of the moon around the earth is elliptical, so the distance between moon and earth varies between 363.104 km (perigee) and 406.696 km (apogee). When a full moon occurs at perigee, the moon looks larger and brighter. It’s not a rare phenomenon, 9 September this year will be the next perigee full moon, and June 2013 there was another one. It’s a bit of a media hype. My friend Chuan took a beautiful picture of this perigee full moon, in the middle of the night, with his point and shoot camera(! ), handheld, 24x zoom. 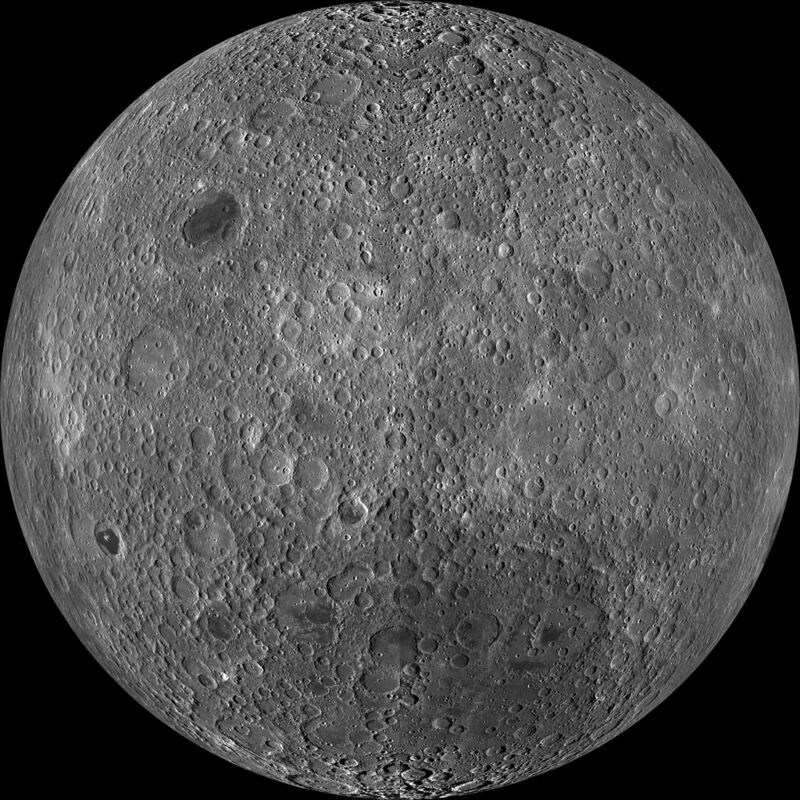 The dark regions are called Mare (Sea) because in the past people believed that there was water on the moon. Actually they are basaltic plains, formed by ancient volcanic eruptions. Huge craters mark the places where meteorites have hit the moon. 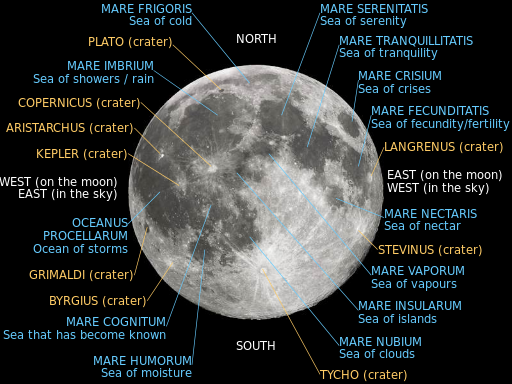 Here is a map of the moon with the names of craters and seas. Not long the formation of the solar system, there was another planet, about the size of Mars, which collided with the (young) Earth. Here is an artist impression of this collision. This hypothetical planet has been named Theia, after a Greek goddess, the mother of Selene, the goddess of the moon. 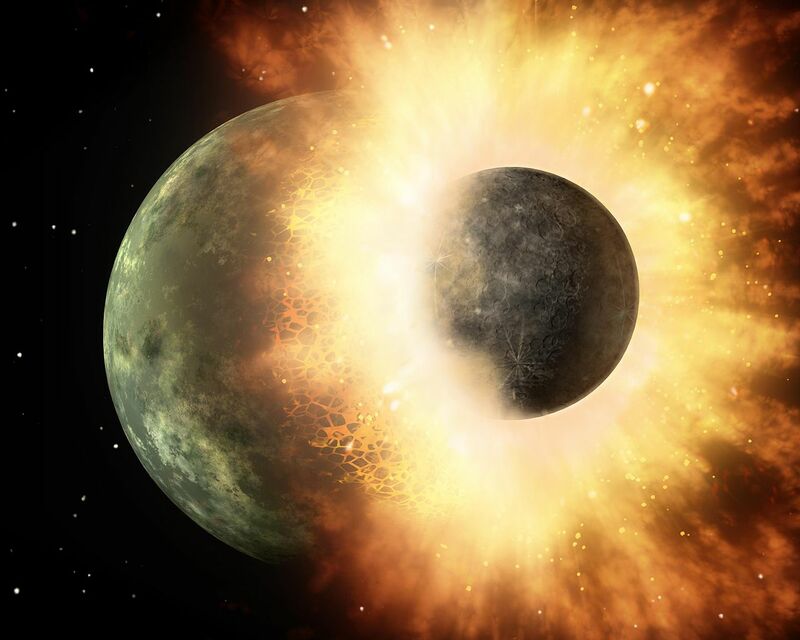 The effect of this dramatic collision was that a large part of Theia and Gaia, as the young Earth is sometimes called, melted together, forming the present Earth, but another part of Gaia and Theia was thrown out during the collision and coalesced into the Moon. So powerful was this collision that the new Moon and probably also part of the Earth consisted of molten magma. 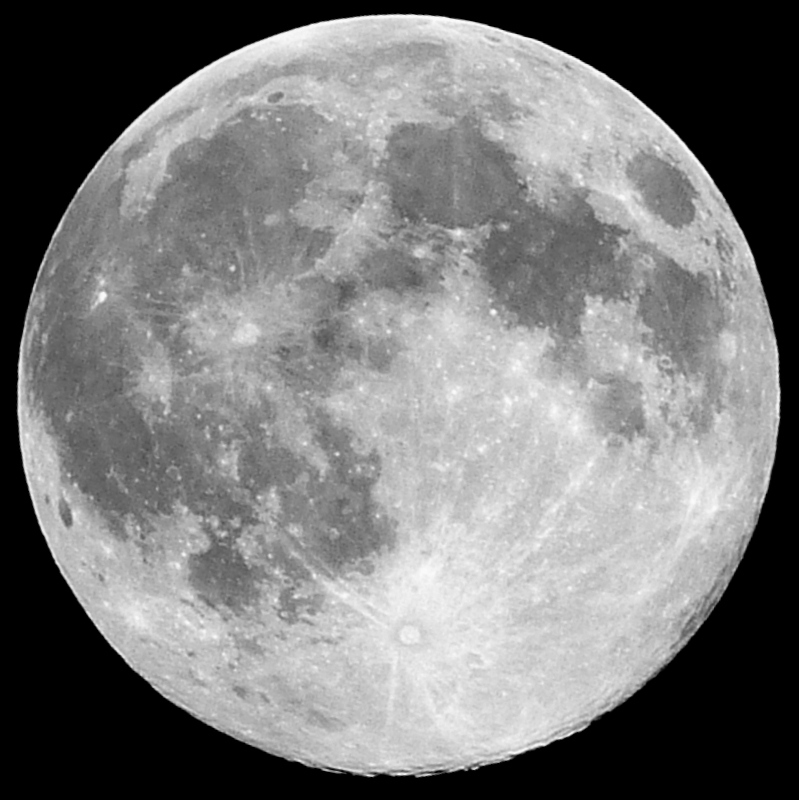 The Moon, being smaller, cooled faster, and because of the heat of Earth and the tidal locking, the near side of the moon got a thinner crust than the far side! 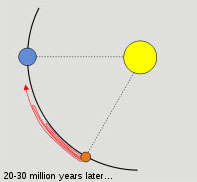 According to this theory that might be the reason that the near side has had more volcanic activity than the far side. 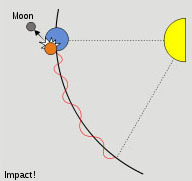 There are many more arguments in favour of this giant impact hypothesis. 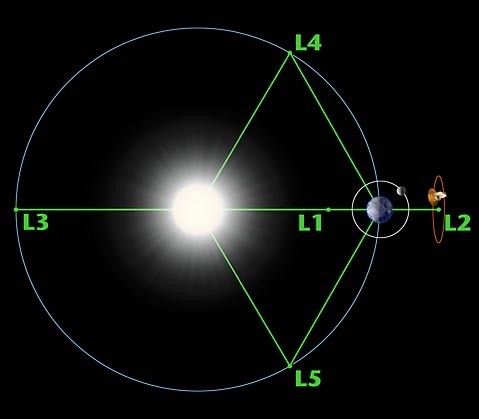 In the Lagrange points L4 and L5 the gravitational force of Sun and Earth balance in such a way, that objects will corotate with Earth around the Sun. 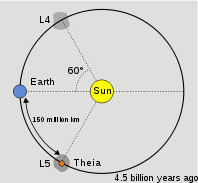 During the formation of the solar system, mass could have accumulated in for example L5 and formed Theia. Through the disturbance by other planets (Venus for example), this planet could, after millions of years, leave L5 and collide with Earth. In January I have published a post about the Rosetta spacecraft, launched in 2004 with as destination a comet, the 67P/Tsjoerjoemov-Gerasimenko. It had gone in hibernation in June 2011 and on 20-1-2014 it woke up again. In the past six months the spacecraft has been coming closer to the comet while its thrusters have slowed it down in a number of carefully planned maneuvers. Today (6-8-2014) was another critical moment. In a thrust of more than 6 minutes, the spacecraft should reduce its speed relative to the comet to about 1 m/s, while at a distance of ~ 100 km away from 67P. It has been confirmed that the operation was successful. 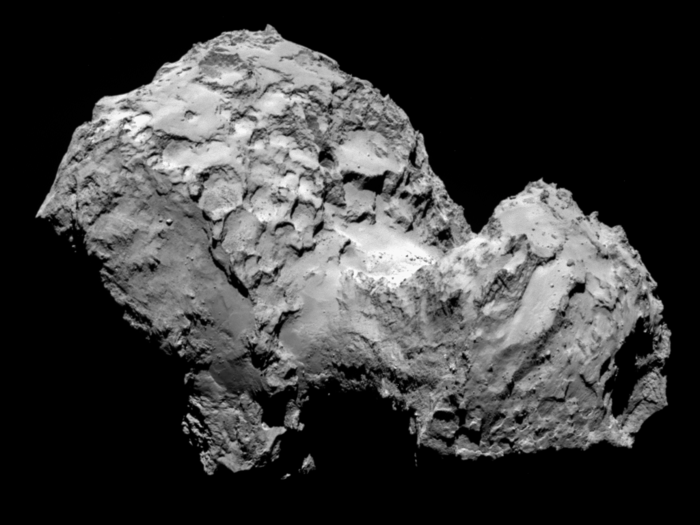 Mind you, the comet and Rosetta are at the moment moving between Mars and Jupiter, on their way to the Sun. The distance to earth is about 400 million km, so signals between Rosetta and Earth take more than 20 minutes! 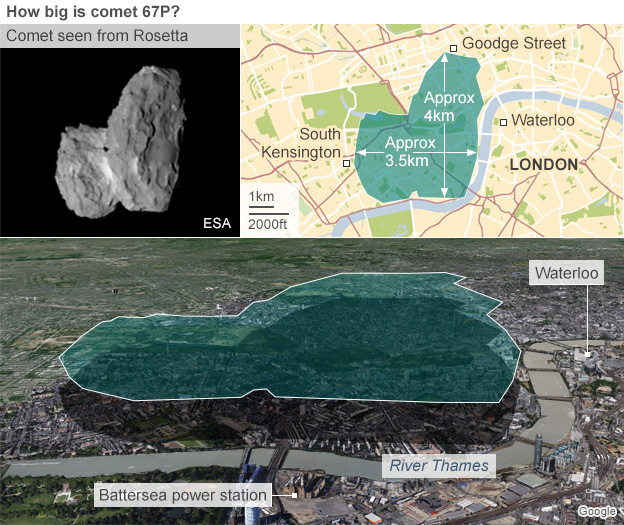 Here is another interesting picture, superimposing the comet on the city of London, to give an impression of its size. What will happen next? Rosetta will follow a complicated triangular trajectory the coming weeks (using again its thrusters) to test and explore the gravitational field of the comet. Here is a YouTube of its proposed trajectory. Almost like an abstract ballet..:-). The sudden orbital changes are caused by the thrusters, the curvature by the gravitational field of the comet. The complicated shape of the comet may make it more difficult to determine its gravitational field. Finally Rosetta will settle down in a stable orbit around the comet, maybe as close at 10 km, and then, in November, it will launch its small probe Philae, to make a soft landing on the comet.